The Scottish Parliament Building committee room ceiling. Enric Miralles Moya (12 February 1955 – 3 July 2000) was a Catalan architect from Barcelona. He graduated from the Barcelona School of Architecture (ETSAB) at the Universitat Politècnica de Catalunya (UPC) in 1978. After establishing his reputation with a number of collaborations with his first wife Carme Pinós, the couple separated in 1991. He later married fellow architect Benedetta Tagliabue, and the two practiced together as EMBT Architects. Miralles' magnum opus and his largest project, the new Scottish Parliament Building, was unfinished at the time of his death. In 1978, he completed his examinations at the Escola Tècnica Superior d'Arquitectura (ETSAB) in Barcelona. From 1973 to 1978 he worked in the architect's office of Albert Viaplana and Helio Piñón. Whilst there—among other things—he was involved in the construction of the Plaça dels Països Catalans, the forecourt for the Estació de Sants. In 1984 after several architectural competition awards, he formed his own office in Barcelona with his first wife Carme Pinós, which they led together until 1991. Within the rising Spanish architecture scene of the late 1980s following the death of Francisco Franco, their unusual buildings attracted international attention. As a result, they received numerous commissions from Spain and overseas. After their separation, Miralles and Pinós continued to work in separate offices. In 1993 Enric Miralles formed a new practice with his second wife, the Italian architect Benedetta Tagliabue, under the name "EMBT Architects". She resumed the practice under his name after his death. The most important projects; the Scottish Parliament Building in Edinburgh and the multistoried building for the Spanish gas company Gas Natural in Barcelona, were only finished after his death. Enric Miralles died at the age of 45 as the result of a brain tumor. The independent architectural language of Enric Miralles can be difficult to classify in terms of contemporary architecture. It is influenced by Spanish architects, such as Alejandro de la Sota, José Antonio Coderch and Josep Maria Jujol, and also from international greats such as Le Corbusier, Louis Kahn and Alvar Aalto and the Russian Constructivist movement of the early 20th century. The freely formed buildings utilising massive building materials and steel, develop from their relationship with the environment and connect themselves to it. The form is constructed using often unusual materials which are generally left with natural surfaces. Form and material interpret the place, traditions and history in a personal and poetic art, as his critics attest. From the starting point of the townscape or landscape he would design a building in its totality, down to the details of the furnishing and the exterior installations. Therefore, the execution of the details was just as important to the communication of meaning as the main form. Both were developed over a large number of designs and with numerous models as the main tool of the design process. 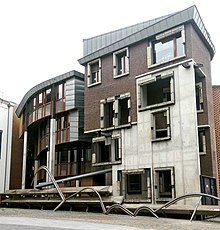 Miralles, like many other postmodern architects, has a preference for piling on the motifs and ideas: upturned boats, keel shapes, deep window reveals like a castle, crow-steps, prow shapes, diagonal gutters, 'bamboo bundles' and above all the dark granite gun-shape that repeats as an ornamental motif at a huge scale. Everywhere broken silhouettes compete for attention, just like the alleyways next door. That's fine, and contextual, but it's quite a meal. As a result of the complexity, the parliament is really a kind of small city, with much too much to digest in one short three-hour sitting. The Scottish parliament will take time to judge: maybe not 50 years but three or four visits, long enough to absorb all the richness and get used to those jumpy black granite guns, the most arbitrary of several questionable ornaments. Enric Miralles was an active teacher at numerous universities. In 1985, he became a professor at the ETSAB in Barcelona. During 1990 he took over the conceptional design chair at the Städelschule in Frankfurt am Main. In 1993, he received an invitation from Harvard University to occupy the Kenzo Tange chair. He taught as a guest lecturer at Columbia University in New York, Princeton University in New Jersey, the Architectural Association in London, the Berlage Instituut in Rotterdam, the Mackintosh School of Architecture in Glasgow and the Universities of Buenos Aires and Mexico City. 1993 The Iñes Table – designed for a project in Grenoble – a multi-use piece of furniture accommodating a variety of working and storage requirements. ^ Mackay, David (5 July 2000). "Enric Miralles". The Guardian. Retrieved 4 August 2016. ^ Charles Jencks (January 2005). "Identity parade: Miralles and the Scottish parliament: On the architectural territories of the EMBT/RMJM parliament building". Architecture Today no.154 p. 32–44. Archived from the original on 9 October 2007. Retrieved 7 January 2007. ^ "Small House for a Kolonihaven, by Enric Miralles". Stories of houses. Retrieved 11 December 2014. ^ Samaniego, Fernando; Serra, Catalina (3 July 1996). "El Congreso de Arquitectos de España expresa su 'miedo' por la liberalización económica" [The Congress of Architects of Spain Expresses its 'Fear' for Economic Liberalization]. El País (in Spanish). Barcelona. Retrieved 17 April 2019. El Croquis 30+49 / 50 Omnibus Volume. Enric Miralles / Carme Pinos: obra construita / built works 1983–1994. Madrid: El Croquis, 1995. Miralles, E.; Taliabue, B. (2004). EMBT Enric Miralles, Bernadetta Tagliabue, Work in Progress (Paperback) (in English and Catalan). Barcelona: Col-legi d'Arquitectes de Catalunya Publications. Zabalbeascoa, Anatxu (1996). Igualada Cemetery: Enric Miralles and Carme Pinos (Architecture in Detail) [Barcelona 1986 – 90; architects: Enric Miralles and Carme Pinós, 1986 competition project; Enric Miralles, 1987 – 90 project and construction]. London: Phaidon Press. ISBN 0-7148-3281-2. Herrero Delicado, Gonzalo (2008). "A building that talks with the sea", A10 new European architecture No. 21, "Section: Beyond transparency" p. 57. Amsterdam: A10 Media BV.